Michaela (“Mickey”) is 3 years old and was diagnosed with Sanfilippo Syndrome (also known as MPS III), a rare genetic disorder sometimes referred to as childhood Alzheimer’s. Mickey has subtype-A which is the most common and also, unfortunately, the most severe. She is a bubbly, delightful little girl with a big belly laugh and a giant smile she shares with everyone. She loves her Bear and likes to show off “her baby” little sister Maya. – Help Michaela Beat Sanfilippo (MPS III)! From Mickey’s Parents: “Michaela was a happy, seemingly quite healthy baby. As the disease progressed, however, she began to lag behind developmentally, especially in speech. It was determined that she has hearing loss and is nearsighted, and testing was performed to see if these issues were related. The testing unexpectedly discovered that she has Sanfilippo. 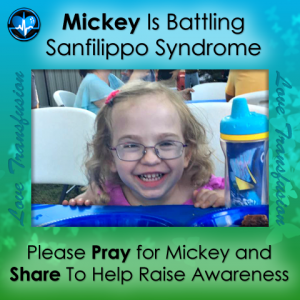 As the disease progresses, children with Sanfilippo like Mickey lose their abilities to speak and understand, to walk, and to eat. The current life expectancy is 10-20 years. Currently there is no treatment or cure, but promising research is happening as we speak in both the US and abroad, so there is still hope for her. Her family and friends are working hard to get Mickey admitted into a clinical trial as soon as possible. With the degenerative nature of this illness, time is precious. Since it is a rare disease, only 1 in 70,000 births, much of the research that has been done has been privately funded by dedicated foundations like the Team Sanfilippo Foundation. We are raising funds to contribute to the Foundation in order to find a cure and treatments for Michaela and all kids like her who have this terrible disease. We also need to raise funds to travel to wherever in the world we are able to get her into treatment- expenses like passports, visas, and airfare. Please let Mickey and her family know she is in your thoughts and prayers by clicking the heart below (equals a hug), Comment or Share.